Distribution and habitat: Nepenthes genus comprises roughly 140 species and numerous natural and many cultivated hybrids. They are mostly liana-forming plants native to Indochina and Malay Archipelago. Some of them can climb more than 10m (33feet) up the trees. The tendril of their leaves helps them to get hold on trees and bushes they use as support. They are generally divided into 2 groups: lowlander (found below 1000m (3280 feet) altitude) and highland (found above 1000m (3280 feet) altitude) species. Some species grow in both areas and are referred to as intermediates. Lowlanders generally experience warm, humid days with a mild night time temperature drop. Average temperatures for lowlanders range from the 27 to 35°C (80-95°F) during the day to 16-21°C (60-69°F) at night. Highlanders do not experience temperatures as hot as lowlanders during the day and tolerate lower night time temperature drops. Highlanders range from the 21 to 30°C (70-86°F) during the day and 10 to 20°C (50-68°F) at night. Most Nepenthes species grow in environments that provide high humidity and precipitation and moderate to high light levels. Most species thrive on the margins of tree or shrub forests or clearings. All Nepenthes grow in extreme habitats of poor nutrients. Peat swamp and mountain rainforests or degraded, eroded areas are typical habitats for pitcher plants. Description: Nepenthes ventricosa x truncata is a hybrid between a lowlander (Nepenthes truncata) and a highlander (Nepenthes ventricosa), both endemic to the Philippines. The Nepenthes ventricosa x truncata inherit the pitcher form of the epiphytic Nepenthes truncata and the pitcher colours and leaves form of Nepenthes ventricosa. Nepenthes are named after for their unusual pitchers or traps. The pitcher is actually a swelling of the mid-vein in the leaf and are used by the plant to trap prey that falls inside it and digest the organic matter. Insects are attracted to this because of nectar odor secretions and its coloration. The slippery rim (peristome) and inner walls of the pitcher encourage insects to fall into the digestive fluid at the bottom of the trap. Nepenthes, like other carnivorous plants, have evolved their pitchers to get nourishment from the insects they catch because of the nutrient lacking soils in which they grow. The enzymes in the pitcher dissolve and digest their prey to aid in growth. It is not necessary to “feed” Nepenthes on a daily basis for good growth. 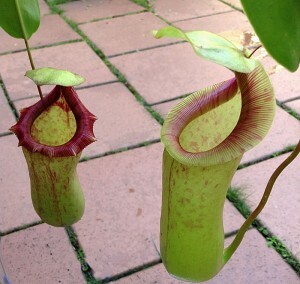 If grown outside, Nepenthes will catch mainly ants and other insects with ease. Nepenthes that do not have access to insects can be supplemented with flies, mealworms or crickets from pet stores to encourage good growth. However, they do not need much. Stuffing a pitcher with prey that is too big will most certainly cause the pitcher to turn brown and die much sooner than if let alone. A little goes a long way with them. Remember, they are plants and can photosynthesize light like other plants to make food for themselves. In other words, Nepenthes wold not “starve” to death if they do not have insect matter for periods of time. At worst, they may slow down on growth. Flowers appear throughout the year and have little aesthetic appeal. Houseplant care: Nepenthes ventricosa x truncata are versatile and adaptable to many different growing conditions. They are relatively easy to care for and will thrive on their own. Nepenthes ventricosa x truncata are not real fast growers and they can live for many years with proper care. Nepenthes ventricosa x truncata older leaves will gradually die back from the trap to the seam. These should be pruned back to the stem regularly to keep the plant tidy. Also cutting off the growing tip of the plant will keep it more compact. Since many Nepenthes are vines, pruning the green stems back will encourage side shoots and a fuller plant. The vines can also be trained up a stake or left to hang low in an elevated container such as a hanging basket. Allowing the vines to descend often encourages the plant to put up new basal shoots, resulting in a prettier plant. It is best not to prune more than 30% of the foliage off the plant at any one time. Plants which are cut back completely to the soil will often die. Light: Can be grown indoors or outdoors in a sheltered positions receiving 50-80% shade or morning sun. Provide the Nepenthes ventricosa x truncata hybrids with bright light (not full sun). In order to give them enough sun energy to produce pitchers they need around 3 hours of direct sun when the sun is out. They can be grown in a greenhouse, sun room, partly sunny window or under lights. Temperature: Nepenthes ventricosa x truncata is frost tender and never go dormant. This hybrid will thrive within a temperature ranging from 16 to 35°C (60-95°F). While Nepenthes often tolerate low humidity, but they usually stop making pitchers. Humid environments such as greenhouses, terrariums or even tents made from sticks and clear plastic bags can provide the needed humidity. Be sure to provide some ventilation to prevent overheating and stagnant air. Additional humidity can be provided by frequent spraying the plant with pure water. When grown indoors, keep the pots on trays with moist pebbles to increase the air humidity around the plant. Water: Keep the Nepenthes ventricosa x truncata moist at all times but not sitting in water. If possible, water the plant with rain water; tap water is acceptable as long as it is flushed with rainwater or soft water monthly. Do not allow Nepenthes to dry out completely. They benefit from moist media and occasional flooding to wash away any accumulated salts. Use relatively clean water such as rain, distilled or purified water. Adding air to the water can help growth by reducing the chance of stagnation. Simply put the water in a clean tightly-covered container, half-filled, and shake it vigorously to aerate it before watering. Avoid dripping cold water on the leaves. Fertiliser: Chemical fertilisers are best used at low strength (at 1/4 strength). Occasional feeding with frozen (thawed before use) crickets may be beneficial. Potting and repotting: Nepenthes ventricosa x truncata need a porous, low-fertility potting mixes. This potting mixture may contain tree fern fiber, chopped fir bark, long fiber sphagnum moss or peat moss with an addition of coarse sand or perlite. A well drained Orchid potting mix will work well for these carnivorous plants. Repot if the pot breaks down, the plant dries out too quickly or plant size indicates the need of a bigger pot. Preferably, do not use clay pots, as salts tend to build up in them. The best time to repot is Spring or Summer. Nepenthes ventricosa x truncata will do well in a 18-20cm (7-8 inch) pot, but some of the larger specimens require containers of 30cm (12 inch) to reach full size. Young plants can be grown in 10-15cm (4-6 inch) pots. Baskets and pots are an excellent way to display larger specimens. This plant is suitable for trailing vines and tendrils to grow. Garden Culture: Depending upon local climate conditions, Nepenthes ventricosa x truncata can make suitable plants for the patio or outdoor garden seasonally or year-round. In temperate areas with regular cool or foggy weather (often coastal areas) these carnivorous plants can be grown with special care. The plants should be kept in a moderately sheltered (50% shaded) area, sprayed frequently and protected from frost. In tropical climates they can be cultivate outdoors year-round. Propagate: Nepenthes ventricosa x truncata can be propagated by cuttings taken at any time of the year, but the cuttings taken when the parent plant is actively growing seem to have greater success rate. Active growing tip of the stem with about 2 to 3 leaves is the absolute best cutting material, but it is not compulsory for the cutting to have the growing tip. Cut off the lower leaf and plant the stem vertically in a pot containing damp Sphagnum moss. The lower node (the point where the leaf was growing) should be under the potting mixture level and the upper node and leaf about the potting mixture level. Place the pot for rooting in a plastic bag or propagating case in conditions of high humidity and moderate light. The cuttings will start root in one to two months and begin to form new pitchers in about six months. When new growth is visible is a sign that rooting was occurred. Once the plants have rooted and started to grow, pot them up in a one size bigger container using standard potting mixture and put them in a terrarium (or partially opened plastic bag) to adapt the new plant to the lower humidity conditions. Problems: Nepenthes ventricosa x truncata are naturally quite pest-free, though there are a few insects which will sometimes present problems in collections. If the plant fails to make pitchers, increase humidity and make sure that the plant has enough light. Most fungal infections on Nepenthes such as sooty mold are easily removed by manual cleaning or treatment with a mild fungicide. Leaf-spot fungus, which is a common problem especially when grown in bright sunlight. Treatment: Treat the plant with a fungicide immediately, remove the affected leaves if possible without destroying the plant and replace the soil with new potting medium. Thrips are a common pest in many cool greenhouses and will occasionally attack Nepenthes. Treatment: They seldom occur in sufficient numbers to present a serious threat. They can be found most often on the undersides of the leaves near the midrib and can easily be removed by regularly wiping the leaves clean. Scale, which are often introduced to the plants by ants, can present a much more severe problem than thrips. Treatment: Though scale can sometimes be kept in check by diligent hand-picking, infested plants may need to be treated with an pesticide. Use mild doses of pesticide to not harm the plants. Uses: Nepenthes ventricosa x truncata are efficiently grown in greenhouses, grow chambers or terrariums where humidity, temperature and lighting can all be controlled. They can be used as windowsill plants or outdoors in hanging baskets or on tables under shade cloth. Nepenthes should thrive with the orchids, needing similar conditions.